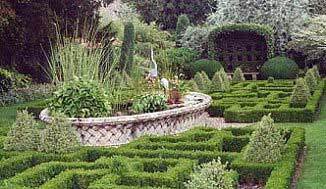 This is the sort of Eighteenth Century Cotswold Stone Manor house and garden that you would dream about owning if you won the lottery and maybe then you couldn’t afford it. 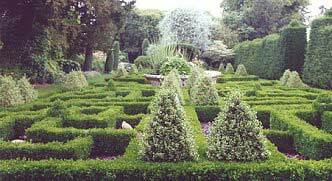 The lucky owners Richard Paice and his wife unconstrained by history as would be the case in a National Trust property have had free reign to use their imaginations and produce a garden which is exciting but at the the same time a place very much belonging to a family. 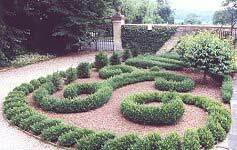 There is much use of Box and the parterre particularly is stunning as its proportions are just the right size to give it magic. On first entering this secret part of the garden you feel like Alice just after drinking some intoxicating brew and the “basket woven” pool is a suitable place for a White Rabbit to take a bath. 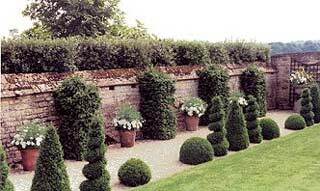 Other parts of the garden are evolving all the time and the geometrical box topiary specimens along the edge of the lawn are a delight. This is certainly the sort of place you would need to revisit to watch the ideas mature and see what new delights have been dreamt up since your last visit. All photographs by Anthony Blagg.